Knowing that the work being performed on your home is done by professionals can really help to ease some of the stress and anxiety of getting a roof repair or roof replacement. In order to get that peace of mind however you’ll need to use one of the best roofing contractors in Howell Michigan which is Livingston Roof Pros. The roofing services we offer are backed by our roofing experts that can give you the exact roof you want at a competitive price. Want to know more about what we can do as a roofing contractor in Howell Michigan? Be sure to read more in this article about the services and reasons why we’re one of the best roofing contractors in Howell Michigan. In fact, almost 99% of the roofing systems that are installed in the Howell Michigan area can be serviced by our roofing team. We offer full residential roofing services to help you with any sort of problems you may be having with your home’s roof. Including roof repair, roof replacement, or if you just need a roof inspection we can handle that too. One of the biggest problems today for many home owners who are getting roofing services done is that they use roofing contractors who aren’t qualified for the project. They may not even be licensed contractors which is why there is such a stigma with most roofing companies. The problem with not using fully qualified roofing companies is that when a roofing material is installed there are strict guidelines from the manufacturer. The number of nails, placing of nails, under-layment, and much more should be adhered to when installing roofing materials. Most roofing manufacturers have certifications that roofing companies need to get to even install any of their roofing products. Without it, you may get a new roof installed only to realize a year or two down the road that it was not installed correctly. The roofing manufacturer can void the warranty on the roof and you could be responsible for replacing the roof simply because the contractor wasn’t qualified. That’s why at Livingston Roof Pros we are completely licensed and insured roofing contractor in Howell Michigan. We have qualifications with all the major roofing material manufacturer and we always use manufacturers specifications on all roofing installations and roof repairs we do. 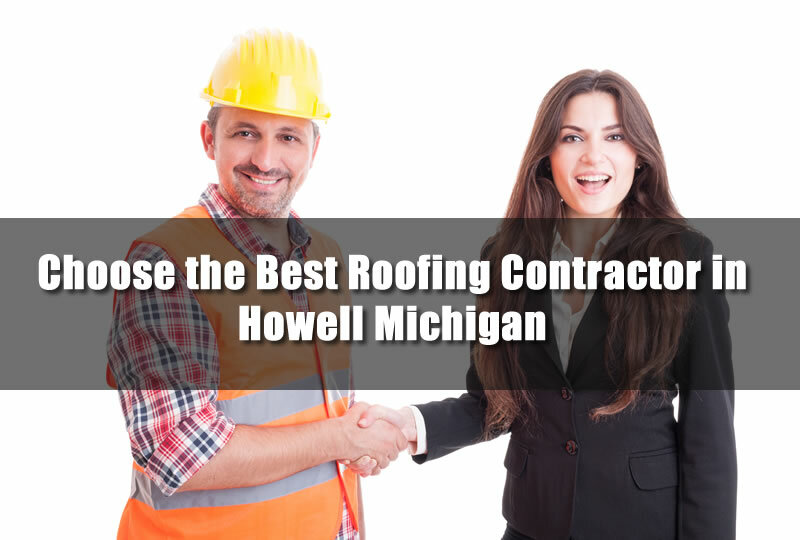 Most of the major roofing materials that are used in Howell Michigan are covered by our certifications and if there is a particular product, please be sure to let us know about it and we determine qualifications for it. Many times home owners really don’t know what type of roofing service they need. They may notice a leak in their homes during a storm and think they may need a completely new roof. But at Livingston Roof Pros we can also repair you roof if needed. We offer roof repair services that we do quickly and professionally. We have a team of roofing experts that can come to your home and make a roof inspection and then update you with the results. You may only need a small roof repair for your home. However, if the case is that you do need a completely new roof installation in Howell Michigan we can also install a new roof for you. Do you need a roofing contractor in Howell Michigan right now? If so, be sure to give Livingston Roof Pros a call and get a free roof estimate on your roofing service.